Being aware of the things you eat regularly is a good way to start implementing a series of changes in your life. “You are what you eat” is a popular saying, and there is a great amount of truth on it, as it is a proven fact that frequent consumption of fast food increases the risk of diabetes and cardiovascular diseases. “Knowledge is power” is another saying and once again, what we are trying to say is that by knowing what you eat, you will be able to understand the outcome of your choices, which ultimately will be reflected in your body and in your long term health. The refined sugars contained in sodas and other highly processed foods are one of the most important factors that create an unbalance in the pH levels of your body, turning it into acidic levels. Human body always keeps blood pH level at 6.5. But what happens when your body is too acidic as a consequence of what you eat or drink? Blood pH balance must be kept, so the body responds by drawing minerals and nutrients from other parts of the system, such as bones and tissues, in order to restore the natural pH balance of the blood. When this happens, you start feeling tired, probably with aching muscles, headaches or perhaps suffering lack of concentration. You tend to overlook the signals because you can quickly remedy the situation by taking some over the counter pain relievers, which will make you feel better... And you will continue taking OTC medication as needed perpetuating the problem. But it is very important to note that you are not addressing the root cause of the problem! A few changes in your eating habits will help you feel better in a natural way. 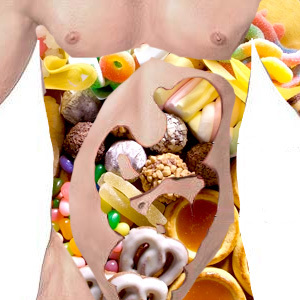 Remember: You are what you eat. Consciously modifying your eating habits, reducing the consumption of fast foods and highly processed products and at the same time incorporating more whole grains, green leaf vegetables and more fruits to your diet will have an immediate effect in your health. Diseases develop faster in an acidic environments, but they cannot survive in an alkaline system. So if you start choosing alkaline foods when you eat, you are reinforcing your immune system, making it stronger. So next time you go to a restaurant, do yourself a favor and skip the soda. Iced tea is a much better choice, because tea contains antioxidants which are good to fight free radicals. If you don’t like iced tea, just go ahead and add some lemon to regular tap water. Lemon although acid per se, has alkalinizing properties when absorbed by the body (potassium, sodium and other minerals). Just by doing something as simple as drinking lemon water every day, you are helping maintain a healthy pH balance in your organism.